The Latin Mass Society will be celebrating Holy Week with a wealth of traditional liturgy and exquisite sacred music at St Mary Moorfields in the heart of the City of London. Beginning on Spy Wednesday with Tenebrae, one of the oldest offices in the Catholic Church, this year’s Triduum celebration will feature the rarely heard complete set of Responsories by Spanish Renaissance composer Carlo Gesualdo (1566 – 1613), directed by renowned professional musician and classical pianist, Matthew Schellhorn. The Responsories were composed just two years before Gesualdo’s death in 1611. Written for six voices these extraordinary settings perfectly capture the intensity of the unfolding of the Holy Week narrative. 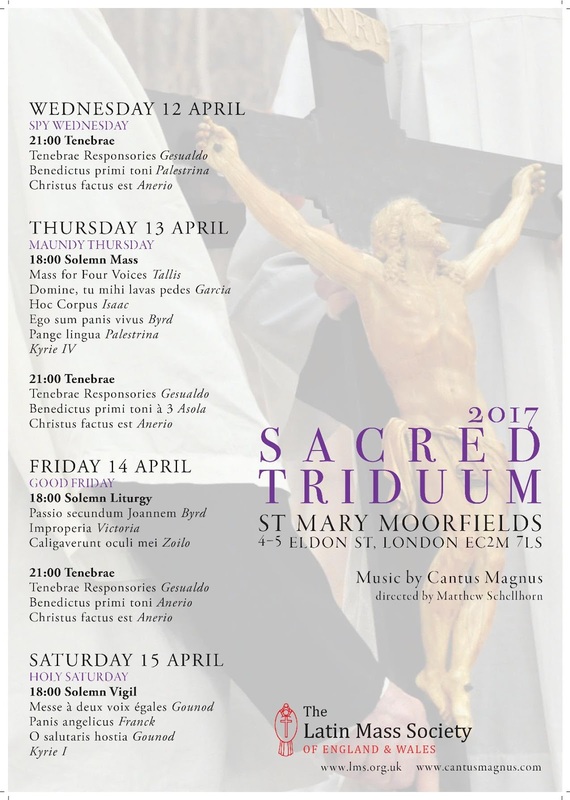 Other highlights performed by the professional group ‘Cantus Magnus’ include the Mass for Four Voices by Thomas Tallis on Maundy Thursday, Byrd’s Passio secundum Joannem on Good Friday and the Messe à deux voix égales on Holy Saturday. There is also an incredible array of religious music spanning hundreds of years including composers such as Garcia, Isaac, Byrd, Palestrina, Anerio and Gounod.